Farrar, Straus and Giroux, 9780374529963, 224pp. 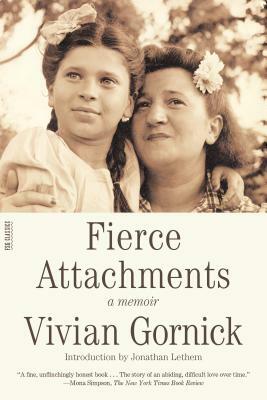 In this deeply etched and haunting memoir, Vivian Gornick tells the story of her lifelong battle with her mother for independence. There have been numerous books about mother and daughter, but none has dealt with this closest of filial relations as directly or as ruthlessly. Gornick's groundbreaking book confronts what Edna O'Brien has called "the prinicpal crux of female despair": the unacknowledged Oedipal nature of the mother-daughter bond. Born and raised in the Bronx, the daughter of "urban peasants," Gornick grows up in a household dominated by her intelligent but uneducated mother's romantic depression over the early death of her husband. Next door lives Nettie, an attractive widow whose calculating sensuality appeals greatly to Vivian. These women with their opposing models of femininity continue, well into adulthood, to affect Gornick's struggle to find herself in love and in work. As Gornick walks with her aged mother through the streets of New York, arguing and remembering the past, each wins the reader's admiration: the caustic and clear-thinking daughter, for her courage and tenacity in really talking to her mother about the most basic issues of their lives, and the still powerful and intuitively-wise old woman, who again and again proves herself her daughter's mother. Unsparing, deeply courageous, Fierce Attachments is one of the most remarkable documents of family feeling that has been written, a classic that helped start the memoir boom and remains one of the most moving examples of the genre. Vivian Gornick's books include Approaching Eye Level, The End of The Novel of Love, and The Situation and The Story. She lives in New York City.